Posted on Saturday, March 22nd, 2014 at 3:35 pm. Constellation Studios is proud to join in Earth Day Lincoln as a sponsor, April 12, noon – 5:00, in the Union Plaza park, 21st and P Street, right across the street! 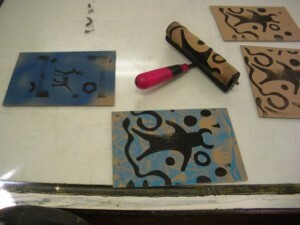 While enjoying the trails, activities and mindfulness on our Earth, hop over to Constellation Studios for some fun printing activity to create your own take away print. We will play around with colors and simple “earthy” printable blocks to roll and stamp away all day on this Earth Day celebration! Posted on Saturday, March 22nd, 2014 at 3:00 pm. Join Constellation Studios on the First Friday Gallery Walk 6:00 – 9:000m. This will be the last chance to see the exhibition “Of Process: Drawings, Blocks, Prints by Karen Kunc”. 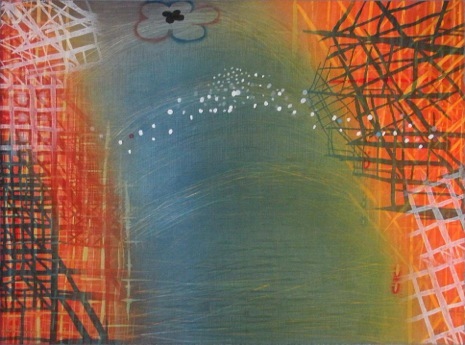 View her new print “Sending & Receiving”, delicate transmissions occur across the diaphanous space between looming structures. Posted on Monday, March 17th, 2014 at 8:30 pm. 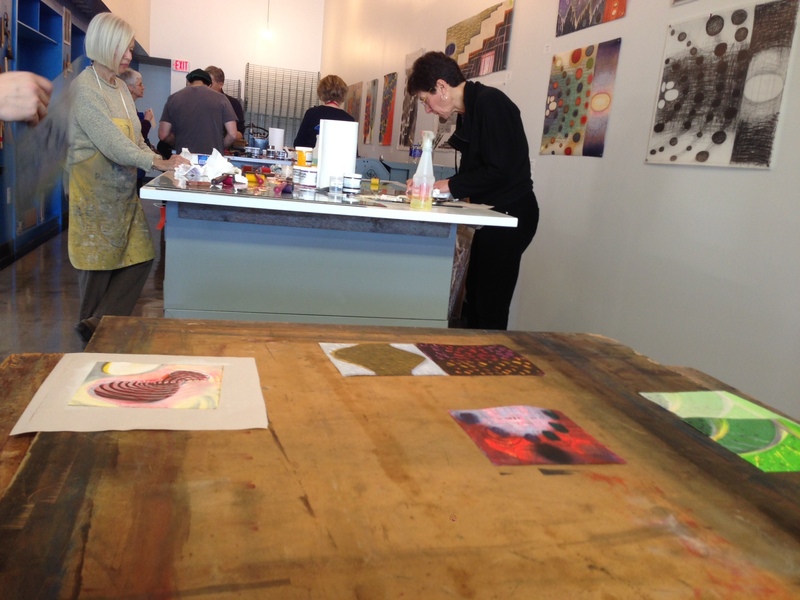 The first Invitational Ink Day brought several area artists into Constellation Studios for a monotype co-working session. We felt out some of the logistics of having a group working in the space through a fun and experimental approach. It was surprising how fast the time flew and none of us want to wrap up as the day neared an end! 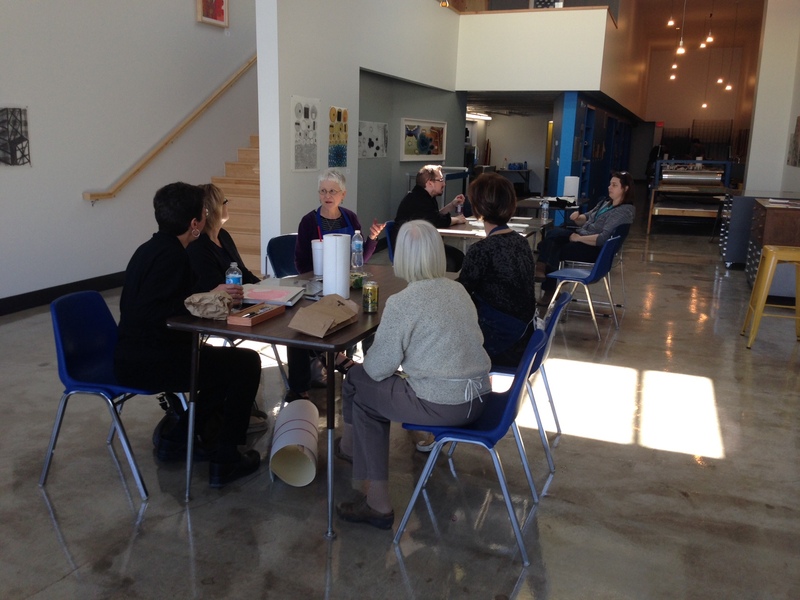 Area artists collaboratively working away on monoprints during the first Invitational Ink Day. We stopped for a quick lunch break between pulling prints. Posted on Tuesday, March 11th, 2014 at 10:44 am. Thanks, Lance, for visiting and bring out the great Constellation Studios story! Constellation Studios has received a nice recognition by the Preservation Association of Lincoln with the 2014 City Center Award, that recognizes outstanding effort in maintaining the vitality of Lincoln’s urban core! 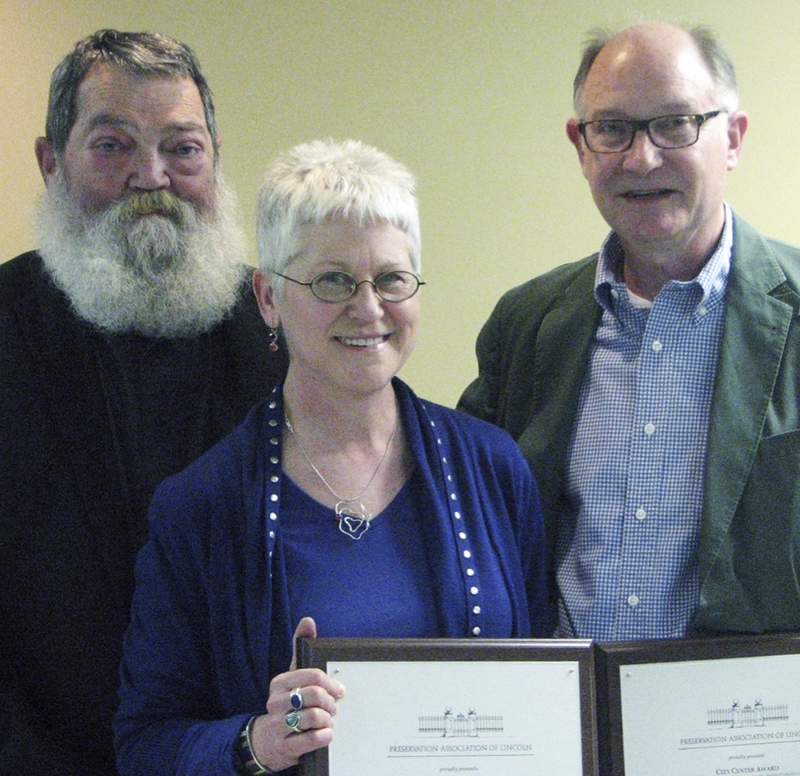 An awards ceremony was held on Sunday, March 9th, with Karen Kunc and Kenny Walton recognized along with BVH Architects, here represented by our team leader Dan Worth.